Given the opportunities to Let Freedom Reign in Valley Forge & Montgomery County, PA, Labor Day here is a prime spot for one last summer hurrah. While discovering our many possibilities, be sure to share your posts, photos, tweets, and status updates by using #MakeItMontco. Perhaps you&apos;ve procrastinated with gathering your back-to-school supplies. Or your idea of a perfect three-day weekend is one spent refreshing your closet. Labor Day specials have been peppered throughout King of Prussia Mall all weekend long. 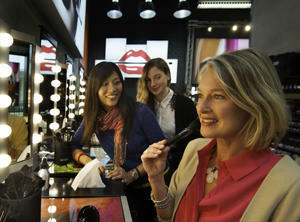 For example, Sephora is providing a complimentary mini makeover on Saturday, August 30. Mall hours, including Labor Day Weekend, are 10 a.m. to 9 p.m.
Philadelphia Premium Outlets&apos; Labor Day Weekend Sale is a Friday-to-Monday event (9 a.m. to 9 p.m.) that offers extra values on top of the everyday savings of 25-65 percent. Among the enticements is a free Labor Day tote (with $35 purchase) from The Body Shop. The summer series of trolley tours at Valley Forge National Historical Park is reaching its final weekend of daily departures; on September 6, it returns to only Saturday and Sunday options. 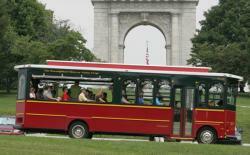 A festive, old-fashioned trolley is your transport for a 90-minute guided tour of the park and its historic highlights. Pricing varies by age ($16.50 for adults), and the adventure starts at the Visitor Center at 11 a.m., 1 p.m., and 3 p.m. In addition, Montgomery County&apos;s other historical sites - Pennypacker Mills, Peter Wentz Farmstead and Pottsgrove Manor - are all maintaining their usual Saturday and Sunday hours but are closed on Labor Day Monday. Devote part of your weekend to melting away stress and easing your mind. The Evolve Music and Yoga Festival at Fellowship Farm, Pottstown, runs all weekend long, from August 29 to September 1. The four days celebrate the creativity of the human spirit and bring together more than 50 bands, yoga instructors, visionary artists, environmentalists and guest speakers in a lively exchange of energy and ideas. Relax in the great outdoors at the John James Audubon Center at Mill Grove. Hours this weekend are Saturday (10 a.m. to 4 p.m.) and Sunday (1 p.m. to 4 p.m.), with the center closed Labor Day itself. The first American home of artist-naturalist John James Audubon is a treasure to explore, but the grounds themselves offer additional appeal. On a late-summer day, they are lush and green and provide views unparalleled just about anywhere else in the county. With a three-day escape from your desk, this is no weekend to be sitting. Dance the night away at the Valley Forge Casino Resort. DJ Rickey Lee takes over the Center Bar on Saturday from 8 p.m. to 2 a.m. Grab the gal-pals and celebrate the beach without all that sand in your bathing suit. Bahama Breeze offers live music, Caribbean-inspired drinks and a summery menu all weekend long. Dale Knight provides the tunes Friday, and Alzonia takes over for Saturday and Sunday. Arnold&apos;s Family Fun Center is an indoor wonderland for bowlers, go-karters, video game fans and laser tag warriors. Summer Playcation specials are heading into their final weekend this Friday, Saturday, Sunday and Monday. Enjoy unlimited rides (nearly every attraction) for the entire day for the unheard-of price of $39.99 per person. Hours are 11 a.m. to 8 p.m. Fly on over to the Elmwood Park Zoo on Saturday, August 30, at 11:30 a.m. for another thrilling Birds in Flight live show. This entertaining and educational program features various live species that soar over the audience. In addition, the giraffe-feeding encounters continue, but not for much longer (the giraffes will be relocated to a warmer climate this fall). Child admission to the zoo (3-12) is $10; adult admission is $14. Senior and student discounts are available. While you&apos;re there, check out the new zipline course; as our blog explained, it is an unforgettable adventure and covers a wide range of appropriate ages and abilities. Green Lane Park offers many opportunities for a Labor Day escape. Come for a day and fish, hike, bike, run or tour by kayak, paddleboard or pontoon boat. For a mere $20 a night, pitch a tent at one of the camping sites, as our blogger recently did. 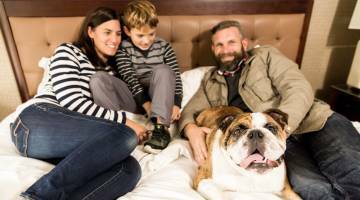 For accommodations that offer a bit more in the way of amenities than camping, the Valley Forge Tourism & Convention Board&apos;s website is stocked with special hotel offers (that include a bag full of giveaways) to celebrate the ability to "Let Freedom Reign" in Montgomery County. This Labor Day Weekend, you couldn&apos;t do better in planning a true getaway.